Today, I spoke to a woman who has traveled to over 70 countries — many of them with her three daughters. She described her kids as worldly, and said that they love to travel. She told me that while they never remember their birthday gifts, they always remember details from their trips to Italy, Vietnam, and Laos. I sighed hopefully. Ben and I wonder if maybe, after all of our efforts, we won’t successfully pass on the travel bug to Little One. Perhaps he’ll be someone who gets shivers each time he passes an airport, dreads the possibilities that new cities offer, and dreams of staycationing with Netflix and takeout. It’s not impossible. After all, my parents did their best to infuse a love of museums in me, but visits to endless (and top-notch!) museums had the opposite effect on me. I find them suffocating, a sorry way to spend a glorious — or even not so glorious — day, when I could be outside, at a restaurant, or spending time with friends. So, if Little One hates travel, we will need to take some of the blame. Our two-week trip to Chile had its high points, but it also had its low points. Here are all of the worst decisions we made during our two-week trip to Chile, with our 13-month-old in tow. Repeat them at your risk. Oh my God, are you exhausted from reading that? There was too much moving around and not enough time to get comfortable. Amazingly, Little One was a real trooper until we returned to Santiago for our final days. Then, he had had enough, and we basically did nothing except buy gifts for family members. Including a three-hour stopover in Lima, Peru, it took us 15 hours in total to get to Chile. Yeah, that’s a long time. Especially with a toddler who is in that stage where he loves to move around. And then three days after beginning to get comfortable, we boarded a plane again! To Patagonia. And then had to drive another three hours to our destination. I love logistics, said no one. But, unfortunately, sometimes travel is all logistics and finances and lots of boring, annoying stuff until you get to the good stuff. We were dead set on going to Torres Del Paine because who goes to Chile without going to Patagonia and exploring its incredible, otherworldly national park? Well, apparently, a lot of people. But not us, with the 13-month old. Unfortunately, Torres Del Paine is at least a 90-minute drive from Puerto Natales, the closest town, which means that in the best scenario, you need to drive three hours in one day. While we were ready to be adventurous, we were not ready to pay $250+ per night to stay in a hotel located in the park. Had we sprung for any such hotel, we would’ve saved hours of driving each day, seen much more of the park, gotten more sleep, and experienced at least a little bit less anxiety during that crazy, whirlwind visit. This was one of the first times in my life that I seriously considered booking a tour — the type where someone picks you up, buses you around to all of the hotspots, waits until you say ooh and ah and type in all of your hashtags, hands you a snack, and then drops you off back at your hotel. We thought that we could see the park on our own terms, and maybe we could have, if we hadn’t run out of gas as soon as we arrived. Torres Del Paine is an enormous national park and I strongly believe that having a guide would’ve made the trip a lot more enjoyable. Our one experience in Torres Del Paine involved the strongest wind I’ve ever experienced. Check out Ben’s hair. Here’s a tip: If you hate process, your Little One despises process and will let you know. After returning from Patagonia to the airport in Santiago, we made the wise and very mature decision to take one taxi directly from the airport to our Airbnb in Valparaiso. Quick, easy, and minimal crying. Yay. 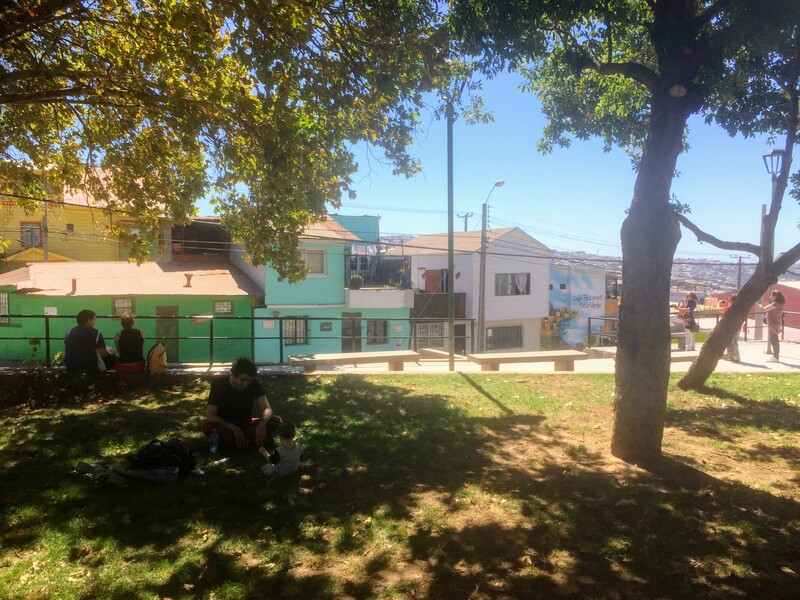 But then when we left Valparaiso, we decided to bus it to Santiago, which meant that we took a taxi to the bus station, then the bus, and then a taxi to our Airbnb. Little One was not having it. When we first landed in Chile, Little One was a ball of energy. He literally did not want to go to sleep. And he even had his own pack ‘n play and a separate room to make it easier. But, he just wanted to play and cruise and throw things. So, we went with it. On a typical day, we were still busy exploring at 7 pm, and at 9 pm, we were just heading out to eat. He was often up for it, but we still felt like we should’ve quieted things down for him at around 7:30 pm at the latest. He needed to unwind and to have some quiet time before heading to bed. Well, as it turns out, 13 months is too old for a bassinet. Not technically — they’ll still give it to you. But it’s the rare toddler who wants to lay flat in a bassinet that’s made for an infant. Miraculously, LATAM Airlines didn’t charge us for it. But the upside of booking a bassinet was that we were in the first row of coach, which is what I call “First Class for Parents.” Tons of extra legroom, which was perfect for Little One’s cruising pleasure! On one of our emptier flights, Ben and I decided to experience the life of parents who book their Little One his own seat — without our actually having purchased said seat. Little One hates driving, but at least the car’s motion can sometimes lull him to sleep. The plane did no such thing, and he refused to sit in it. So, we just had another bulky thing to carry around. Although we only packed one suitcase for the three of us for our two weeks in Chile, we brought way too much on the plane. Ben and I each had a backpack, which was filled to brim with Little One’s toys, diapers, books, and toiletries, along with our iPads. Then, we had a separate bag full of food for Little One. And then we had our jackets, a blanket, and the carrier. Is this even avoidable? Our Airbnb in Punta Arenas was a 30-minute walk from the city center. And a not too exciting walk either. Guess what we learned when we took a cab? It cost $1.50 and it took five minutes. When we travel, Ben and I often dub ourselves, “the idiots” — and this was one of those times. Thankfully, we made some fantastic decisions as well — things that may in fact make Little One love to travel after all. Stay tuned! What are some of your worst decisions when traveling with a baby? I seriously needed this caffeine fix. And the copious amounts of cream.